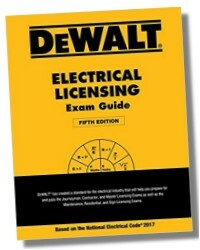 For years, electricians and apprentices alike have turned to the DEWALT ELECTRICAL LICENSING EXAM GUIDE for all of their licensing exam preparation needs. 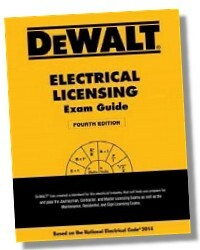 With a commitment to delivering both the need-to-know knowledge and valuable test-taking strategies to demonstrate that knowledge, it is a comprehensive and thorough guide to successfully mastering various state and local electrical licensing exams. 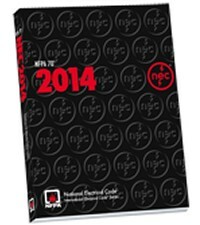 Its latest edition, based on the 2014 National Electrical Code®, is no exception. 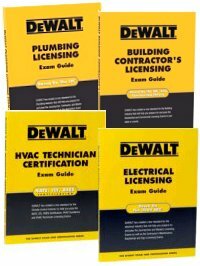 Covering Journeyman, Contractor, Master, Maintenance, Residential and Sign licensing exams, it takes a non-state-specific approach to its content coverage, making it a useful tool for students anywhere. At the core of the book's value: proven methods for exam preparation, including study aids and tips, examination regulations, formulas and references, and realistic sample exams with over 500 practice questions. As a result, students will develop accurate expectations of what to expect in the exams, and key techniques for passing them. 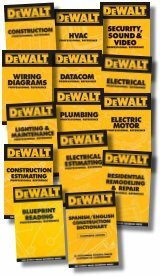 Includes access code to DeWalt's Online Licensing Exam Prep Course (a $49.95 value) to help prepare by simulating the actual Licensing Exam experience - with practice quizzes and exams in an interactive online format. Softcover - 331 Pages - 8-1/2 x 11 in. H. Ray Holder of San Marcos, Texas, has worked in the electrical industry for over forty years as an apprentice, journeyman, master, field engineer, estimator, business manager, contractor, inspector, and instructor. Mr. Holder is a graduate of Texas State University and holds a Bachelor of Science Degree in Occupational Education. He was awarded a lifetime teaching certificate from the Texas Education Agency in the field of Vocational Education. He is a certified instructor of electrical trades. 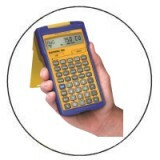 His classes are presented in a simplified, easy-to-understand format for electricians. He has taught thousands of students at Austin Community College; Austin Texas Odessa College at Odessa, Texas; Technical-Vocational Institute of Albuquerque, New Mexico; Howard College at San Angelo, Texas, and in the public school systems in Fort Worth and San Antonio, Texas. He is currently Director of Education for Electrical Seminars, Inc. of San Marcos, Texas. Mr. Holder is an active member of the National Fire Protection Association, International Association of Electrical Inspectors, and the International Brotherhood of Electrical Workers.